This is a page from our son Matthew’s baby health book from Burkina Faso. There are a number of cases of boils in over a period of six months. Because the official language of Burkina Faso is French, the baby book is in French. 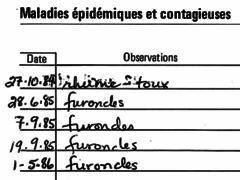 So you see mention of “furoncles” – boils in French. Notice the s on the end of the word. Matthew did not have a boil each time, but multiple boils. Each time he had antibiotics, and that cleared up the boils, but not for long. In one sequence, he was given antibiotics for 10 days on September 7 (7.9.85 on the health card). They cleared up, The course of antibiotics ended on the 16th, and on the 19th the boils came back worse than ever. If I remember correctly, he woke up with 8 or 10 boils on the 19th. The doctors had no answer other than to give repeated and frequent courses of antibiotics. One doctor told us that the staff germ that caused the boils was found in the soil and in the dust. In short, it was everywhere. The boils were painful and Matthew began to dread going to the doctor. Then we told a missionary couple with another organization. They said that we should treat him aggressively for prickly heat including bathing him with certain soap we could find at the pharmacy and applying a specific lotion for prickly heat after his bath. They also said that we should give him children’s vitamins with zinc. The prickly heat rash causes small breaks in the skin through which the infection can enter, they said. There were no children’s vitamins with zinc in Ouagadougou, so we got family to buy Flintstones Vitamins with zinc in the USA and send them to us. While waiting for them to arrive, we began washing him with the soap and treating him with the lotion for prickly heat. It was not a complete cure, but the cases of boils immediately became less frequent. After the vitamins came, they stopped altogether. When Mark came along, we gave him the vitamins and washed him with the special soap and he never had boils. We were shocked that none of the doctors we consulted suggested any of the steps that solved the problem. Apparently, they did not know that it could be solved with vitamins containing zinc or by treating prickly heat aggressively. But God knew that we would not find the answer where we were looking, so he sent that missionary couple our way. We ran into them without planning to, and we just happened to tell them about the boils. God set up that meeting. Many times we have found comfort and solutions beyond what science could provide in the people God put around us. This entry was posted in Burkina Faso, Faith now, Health, Heart language, Personal experience and tagged boils. Bookmark the permalink.